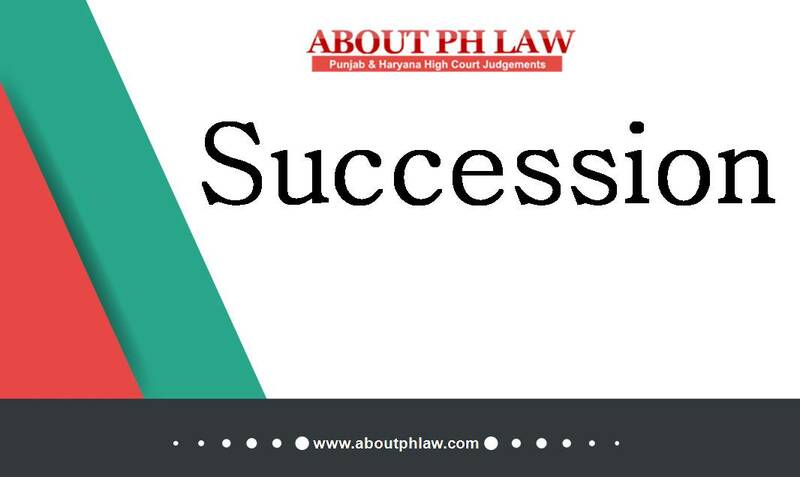 By phlaw| 2019-04-02T18:22:19+00:00 April 2nd, 2019|Hindu Succession|Comments Off on In order to establish claim with regard to nature of the property being ancestral, it has to be prima facie proved that the plaintiff was 4th generation in lineage and his father had acquired the same from his grandfather-Mere recital in the lease deed would not clothe the status of the property being ancestral even though supported by revenue records-Hindu Succession Act, 1956. March 20th, 2019 | Comments Off on Hindu Succession Act, 1956, S.6–Inherited Property—Self Acquired property-­ Property inherited by Class-I heir from his father as per Section 8 of the Hindu Succession Act, 1956, would be his individual property and would not be ancestral property or joint Hindu family property. Female Hindu died Intestate–On the death of a female Hindu having inherited the property from her father or mother or husband or her father-in-law in absence of her children or grand children, property would revert back to the father in case Clause (a) is applicable, to husband in case Clause (b) is applicable and it is the heirs of father or husband which has to be seen at the time of death of female Hindu. March 4th, 2019 | Comments Off on Female Hindu died Intestate–On the death of a female Hindu having inherited the property from her father or mother or husband or her father-in-law in absence of her children or grand children, property would revert back to the father in case Clause (a) is applicable, to husband in case Clause (b) is applicable and it is the heirs of father or husband which has to be seen at the time of death of female Hindu. Hindu Succession Act, 1956-Family Settlement—A stranger is not entitled to challenge a family settlement arrived at by the mother on her behalf as well as on behalf of her minor children, which is not disputed by the minor children on attaining majority. November 24th, 2018 | Comments Off on Hindu Succession Act, 1956-Family Settlement—A stranger is not entitled to challenge a family settlement arrived at by the mother on her behalf as well as on behalf of her minor children, which is not disputed by the minor children on attaining majority. Hindu Succession Act, 1956, S.6–Coparcenary property-Married daughter does not have right by birth in the coparcenary property and that right has only arisen after amendment i.e. w.e.f. 09.09.2005. January 1st, 2018 | Comments Off on Hindu Succession Act, 1956, S.6–Coparcenary property-Married daughter does not have right by birth in the coparcenary property and that right has only arisen after amendment i.e. w.e.f. 09.09.2005. August 12th, 2017 | Comments Off on The plaintiff had earlier filed a suit claiming his right under the Hindu Succession Act and he could have taken the plea of promogeniture only in the first suit and the second suit could not have been filed-Therefore, the suit was also barred under Order 2 Rule 2 CPC.